Now that BlackBerry Messenger is out for both iOS and Android devices, it would be a good time for us to compare it with the already established IM services like WhatsApp. BlackBerry has not been doing well enough in the Smartphone market recently, but it turns out that BBM might become one of the major reasons to worry for the IM giant WhatsApp. Till now, WhatsApp has held a firm ground as far as user base and popularity is concerned. Even though the likes of WeChat, Line or Kik Messenger followed, WhatsApp continued to be the favorite. But now, with BlackBerry Messenger stepping into the major mobile platforms, things might change a bit. In fact, BlackBerry has the potential to give a tough competition to WhatsApp. Will BBM be able to stand against WhatsApp and other similar IM services, or will WhatsApp continue to be people’s favorite, only time can tell. Both WhatsApp and BBM use their own unique methods of running their proprietary messaging services. Thus there are some differences between the two in terms of functionality and features. This is perhaps the most important factor when we consider social apps and services. Since we are readily sharing information with other people, we want to be sure that this information is not accessible to any unwanted individuals. WhatsApp has been a frequent victim of security breaches ever since its launch. According to Wikipedia, WhatsApp messages were initially sent and delivered in plain text; although the issue was addressed later. Some other reports also suggested that you could change the status of a WhatsApp contact by just having access to his / her phone number. Though most of these security holes have been patched (reportedly), WhatsApp continues to be vulnerable. In fact, some people have claimed that it is possible to even obtain the encryption key used for sending and receiving messages, making it possible to eavesdrop on conversations and easily fake your authentication as another user. On the other hand, BBM is well known for its industry grade security from the BlackBerry Team. BBM is more reliable as messages are fully encrypted and only the sender and receiver have the ability to fully decrypt messages. So, in terms of security, BlackBerry takes the lead. All new BBM registrations generate a unique ID known as the BBM PIN. This PIN is used to invite a person to chat on BBM. Hence, you don’t need to share your phone number / email in order to invite people. BBM does not reveal personal details about its users unless they opt to share it. WhatsApp on the other hand uses phone number for registration. That means, in order to invite people to WhatsApp, you have to share your phone number with them, even if you don’t want to. WhatsApp also shares (by default) potentially sensitive user information like latest online time, contact details, etc. When it comes to Group chats, WhatsApp often gets a lot of criticism. If any of your WhatsApp Contacts add you to a group having other unknown people, everyone in the group will immediately have access to your phone number, even if you don’t want to share it with them. If you don’t wish to join in a group on WhatsApp, you have to manually leave it; otherwise, you’ll keep receiving group messages – which could become really frustrating at times. Thus, clearly, BBM has significant advantage over WhatsApp when it comes to user privacy. Next thing we want to compare is the message delivery notification system used by the two IM services. Three signal bars: Message is being sent. Tick Mark: Message is successfully sent to the server. D: Message has been delivered to the receiver. R: Message has been read by the receiver. Timer symbol: Message is being sent. Single Tick Mark: Message is successfully sent to the server. Double Tick Mark: Message has been delivered to the receiver. Blue Double Tick Mark: Message has been read by the receiver. After the changes in WhatsApp’s notification system, both BBM and WhatsApp are on par with each other in terms of notification features. Both BBM and WhatsApp offer more or less the same set of messaging and content sharing options. Both allow support for text messages, emoticons, voice messages and other attachments. Both support group messaging and broadcast messages. BBM gives you additional group management options like including appointments, notes and other attachments to a group. Also, BBM lets you to add a chat partner to an existing chat. WhatsApp, on the other hand allow better customization for chat screens; for instance, you can change the chat background color in WhatsApp. BBM also offers another useful feature called the “Two-way opt-in” process. A chat can be initiated between two parties only if one sends the invitation and the other accepts it. In WhatsApp, a person can immediately start chatting if they possess the contact number of the other. No confirmation is required at the other end even if they are unwilling to join the conversation. The winner in this category depends on user’s preference, but BBM does offer more additional features compared to WhatsApp. However, for the sake of the argument, let’s consider this a tie; as the additional features mentioned here are hardly “comparable”. If you wish to change your device / contact number at any point of time, you’d want seamless migration of your contacts and settings. BBM and WhatsApp handle account migration in totally different ways. WhatsApp uses phone numbers for account registrations, so if you wish to change your phone number, you will lose your previous WhatsApp account entirely. If the same phone number is used on a different device, you will lose all your contacts from your previous device. Thus, WhatsApp accounts are very loosely integrated with your contacts. BBM is device specific for BlackBerry users. In BlackBerry OS, the BB PIN is generated for the user against his / her BlackBerry device. However, BBM on iOS and Android follows a different approach. Each BBM user on iOS and Android has their own login credentials. And the BBM PIN is mapped to their account as a whole, not the device itself. So, you can login to BBM on any Android or iOS device and immediately get access to all the previous contacts. So, you may literally switch your devices any time you want to. You can, however, sign in to only one device at a time. Due to seamless contacts and settings migration, we pick BBM yet again. Both BBM and WhatsApp are quite lightweight apps (on iOS, Android and BlackBerry) and won’t be too heavy on your data charges. But the actual cost difference lies in their respective subscription methods. WhatsApp has an annual subscription rate of $0.99 (after one year of free usage) while BBM is absolutely free. BBM leads this one by offering free service to its users. As far as platform compatibility goes, WhatsApp Is a true dominator. WhatsApp is available across all major mobile platforms and supports a wide variety of devices. You can find WhatsApp on iOS, Android, Windows Phone as well as other mobile platforms like Nokia Series 40, Symbian, Asha and even for BlackBerry devices. With this, WhatsApp has made sure that reaches to almost every mobile phone user in the world. On the other hand, BBM is only available on BlackBerry iOS and Android 4.0+ devices. And with many Android users still running a lower version of Android, it’s evident that these users – along with many other mobile phone users – won’t be able to use BBM at least not for now. WhatsApp takes the crown here (at least for now). WhatsApp has more than 350 million monthly active users; BBM only has over 60 million. These statistics clearly show WhatsApp to be more popular. And more the popularity, more are the chances of your friend using that medium. Likewise, there are more chances of finding your friend on WhatsApp rather than on BBM. WhatsApp scores this one yet again with more active users. BBM and WhatsApp work on completely different business models. If you have followed WhatsApp’s strategy closely, you may have realized that WhatsApp was probably targeted to replace conventional SMS. Maybe that’s why WhatsApp accounts are primarily based on phone numbers. Another interesting fact is that WhatsApp is not officially available for tablets. Even though WhatsApp acts like a normal chat messenger, perhaps it would be more suitable to consider it as an SMS substitute. BBM is more of a conventional messenger. It is based on user accounts rather than phone numbers. It is more of an Instant Messenger like Google Hangouts or Yahoo Messenger. 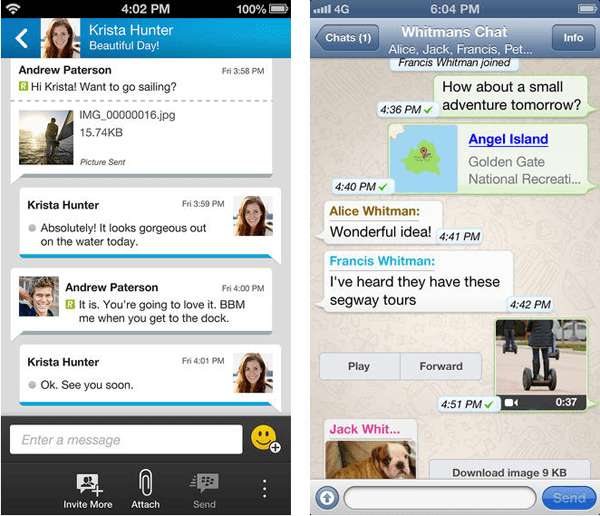 BBM has just been launched in two of the world’s major Smartphone operating systems. It will take some time to gain momentum. Question is, whether BBM’s strategy and features be able to steal existing WhatsApp users or not. It’s a battle of two different strategies. It is up to the users now to determine which strategy is more successful. Who knows? If BBM is further released to support other mobile platforms, maybe the users will get to know of BBM more. And in time, BlackBerry’s business strategy may become more successful. Can BBM make it possible? What do you think? Share your views in your comments below.